The Greatest Dog Show on Earth! 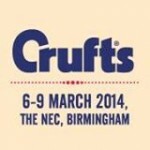 Home » News » Shows » The Greatest Dog Show on Earth! 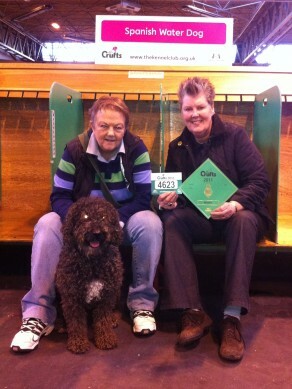 We had a fantastic day at Crufts yesterday! Seeing old friends, meeting new dogs, and even coming away with an award or two! Teto was first to show. I was far too nervous to be at ring side but Tanya did a fantastic job. It was a good size class and the competition was strong. Teto was awarded Reserve, that’s 4th to you and me! Absolutely amazing when you consider his shaky start in life! Next in the ring was our baby Zarza! 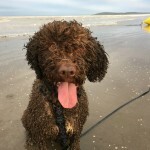 She is just 11 months old and has only ever entered one other show!… What were we thinking!… All the excitement of the big day proved to be a little bit overwhelming and Zarza lost her self control and started to bounce around the ring like a maniac! Luckily the Judge had a sense of humour and couldn’t help but smile at her exuberant behaviour! She has an amazing character and if we can just channel it, I’m sure she has a promising future ahead of her! Zarza was awarded 3rd in her class. Last, but by no means least, was YoYo. We weren’t sure that mum was going to be up to showing, but really wanted to take her with us as she had to stay at home last year because she was in pup! Well… She did us proud! Her class was the biggest on the day and she performed really well. Unfortuately she didn’t get placed, much to YoYo’s relief! She’d much rather be at Flyball anyway! There was one more GranReserva at Cruft’s yesterday. 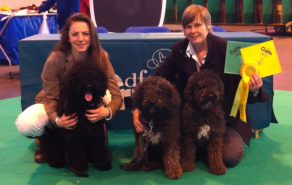 Andrew and Castro came along to take part on the Spanish Water Dog stand at Discover Dogs, where over 200 pedigree breeds are represented. Tanya and Teto are on the stand today along with Angela and Tinto. Danielle and Pat will be there with Bow on Saturday, along with Jo and Rosie! 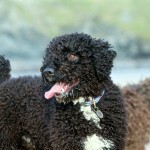 We are very proud and really pleased that all of YoYo’s puppies and their owners are happy to be so involved!